The tools and technique used in the Design of Experiments (DOE) have been proved successful in meeting the challenge of continuous improvement over the last 15 years. However, research has shown that applications of these techniques in small and medium-sized manufacturing companies are limited due to a lack of statistical knowledge required for their effective implementation. Although many books have been written in this subject, they are mainly by statisticians, for statisticians and not appropriate for engineers. Design of Experiments for Engineers and Scientists overcomes the problem of statistics by taking a unique approach using graphical tools. The same outcomes and conclusions are reached as by those using statistical methods and readers will find the concepts in this book both familiar and easy to understand. The book treats Planning, Communication, Engineering, Teamwork and Statistical Skills in separate chapters and then combines these skills through the use of many industrial case studies. Design of Experiments forms part of the suite of tools used in Six Sigma. This book will be useful to engineers and scientists from all disciplines tackling all kinds of manufacturing, product and process quality problems and will be an ideal resource for students of this topic. Dr Jiju Anthony is Senior Teaching Fellow at the International Manufacturing Unit at Warwick University. He is also a trainer and consultant in DOE and has worked as such for a number of companies including Motorola, Vickers, Procter and Gamble, Nokia, Bosch and a large number of SMEs. Manufacturing engineers, project engineers, quality engineers, quality managers, production engineers and students. Some fundamental and practical issues in industrial experimentation. Basic principles of Design of Experiments: Randomization. Replication. Blocking. Metrology considerations for industrial designed experiments: Measurement system capability. Some tips for the development of a measurement system. Selection of quality characteristics for industrial experiments. Exercises. References. Alternative method for calculating the two order interaction effect. Synergistic interaction vs antagonistic interaction. Barriers in the successful application of DOE. A practical methodology for DOE: Planning phase. Designing phase. Conducting phase. Analysing phase. Analytical tools of DOE: Main effects plot. Interactions plots. Cube plots. Pareto plot of factor effects. Normal Probability Plot of factor effects. Normal Probability Plot of residuals. Response surface plots and regression models. Model building for predicting response function. Confidence interval for the mean response. Geometric and non-geometric P-B designs. Example of a 2 squared full factorial design: Objective 1: Determination of main/interaction effects which influence mean plating thickness. Objective 2: Determination of main/interaction effects which influence variability in plating thickness. Objective 4: How to achieve a target plating thickness of 120 units? Example of a 2 to the power of 3 full factorial design: Objective 1: To identify the significant main/interaction effects which affect the process yield. Objective 2: To identify the significant main/interaction effects which affect the variability in process yield. Objective 3: What is the optimal process condition? Example of a 2 to the power of 4 full factorial design: Objective 1: Which of the main/interaction effects affect mean crack length? Objective 2: Which of the main/interaction effects affect variability in crack length? Objective 3: What is the optimal process condition to minimize mean crack length? Construction of half-fractional factorial designs. Example of a 2 to the power of (7-4) factorial design. An application of 2-level fractional factorial design. Example of a 2 to the power of (5-1) factorial design: Objective 1: To identify the factors which influence the mean free height. Objective 2: To identify the factors which affect variability in the free height of leaf springs. How do we select the optimal factor settings to minimize variability in free height? Introduction: Get a clear understanding of a problem. Project selection. Conduct exhaustive and detailed brainstorming session. Teamwork and selection of a team foe experimentation. Select the continuous measurable quality characteristics or responses for the experiment. Choice of an appropriate Experimental Design. Iterative experimentation. Randomize the experimental trial order. Replicate to dampen the effect of noise or uncontrolled variation. Improve the efficiency of experimentation using blocking strategy. Understanding the confounding pattern of factor effects. Perform confirmatory runs/experiments. Case studies: Optimization of a radiographic quality welding of cast iron. Reducing process variability using Experimental Design technique objective of the experiment. Slashing scrap rate using fractional experiments. Optimizing the time of flight of a paper helicopter. Optimizing a wire bonding process using Design of Experiments. Training for Design of Experiments using a catapult. Optimization of core tube life using designed experiments. Optimization of a spot welding process using Design of Experiments. Dr Jiju Antony is Professor of Quality Management and Deputy Director of the Institute of Operations management with the University of Strathclyde. He is also a trainer and consultant in DOE and has worked as such for a number of companies including Motorola, Vickers, Procter and Gamble, Nokia, Bosch and a large number of SMEs. Perfectly delivered on time. 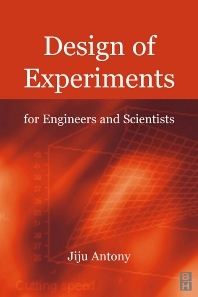 I recommend the book for design of industrial experiments.